00:40 | King Maha Vajiralongkorn Bodindradebayavarangkun yesterday officiated at a ceremony to commemorate National Constitution Day. Thailand’s first Constitution was promulgated by King Rama 7 on December 10, 1932 and has been replaced 20 times since. 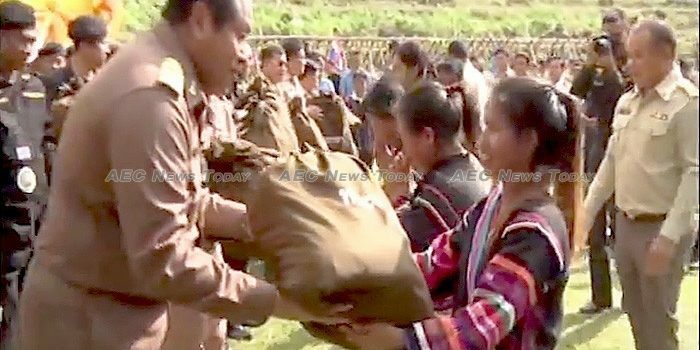 01:28 | A Thai privy councilor yesterday traveled to northern Chiang Rai Province to inspect a number of royal projects and to deliver a token of appreciation to those involved in fulfilling the royally initiated ‘Little house in a big forest’ project in Mae Soi District. 03:12 | Large numbers of people continue to visit the royal crematorium at Sanam Luang. According to the Ministry of Culture (MoC) more than 20,000 foreigners from over 80 countries, have visited the royal crematorium, with the top five by nationality coming from Germany, China, the US, England and France. 04:18 | According to Suan Dusit Poll the majority of respondents to its latest survey said the current constitution emphasises corruption suppression and elimination. The poll sampled 1,164 residents nationwide of which 65.12 per cent said they approved of the 2017 Constitution, while 63.14 per cent of respondents are said to have no objection to the concept of having an outsider as prime minister. 06:00 | Interior Minister General Anupong Paochinda said yesterday that a committee currently reviewing and amending the six draft laws relating to local elections is expected to complete its work next week after which the laws will be forwarded to the Council of State. General Paochinda said he did not know when local elections will take place. 07:00 | Chairman of the Constitution Drafting Commission (CDC), Meechai Ruchuphan, said yesterday that political parties can proceed with preparations for the next general election as long as such work doesn’t involve gatherings and meetings of members. He said that the current ban on political activities will be lifted when the time is right. 10:16 | Government spokesperson Lieutenant General Sansern Kaewkamnerd said that Prime Minister General Prayut Chan-o-cha has expressed satisfaction with the Consumer Confidence Index (CCI), which hit a 33-month high in November. 11:46 | Deputy Transport Minister Pailin Chuchottaworn and his team have visited the Bangkok Mass Transit Authority (BMTA) to acquire information about ongoing projects such as the acquisition of new vehicles, the installation of an electronic ticketing system on public buses, and a procurement contract for 489 NGV buses. Mr Chuchottaworn said the government is examining the possibility of decentralising the BMTA for higher efficiency after the transport agency reported losses and accumulated debt of over Bt100 billion (about US$3 billion). 13:03 | The Department of Disaster Prevention and Mitigation (DDPM) has reported that 56 districts in seven southern provinces are still affected by flood. The Meteorological Department has advised residents in the southern provinces to remain alert for possible flash floods. 14:24 | Government spokesperson Lieutenant General Sansern Kaewkamnerd said that the government has opened the ‘Clear-Cut’ financial information hotline 1357 for SMEs as part of the government’s plans to bolster the sector. He said that the government is working to update laws and measures to support SMEs, such as making it easier for SMEs to raise funds, tax deductions up to three times the real cost spent on research and development, reducing corporate income tax, and promoting new product development to strengthen Thai SMEs competitiveness in global markets. 16:17 | The Ministry of Commerce (MoC) has opened another floating market in Taling Chan District, Bangkok. It is the fifth floating market to be established in Taling Chan and is open every weekend and on public holidays between 9am and 4pm. 17:15 | The Public Relations Department (PRD) has held a news reader training session for more than 40 children aimed at preparing them for a news reading contest to be held on National Children’s Day on January 13. 18:23 | Newsline takes a look at the Thailand Predator League 2018 readiness for competing in the international eSports tournament in Indonesia next month. 21:11 | Thailand’s Ministry of Foreign Affairs (MFA) has issued an official statement supporting the statement by the United Nations Secretary-General on the future of Jerusalem.